Even amongst computer hardware enthusiasts, overclocking is a subject that is not always completely understood. At the most basic level, overclocking is merely making hardware such as the CPU or RAM run at clock speeds that are above stock. This allows the user to achieve an increase in performance without spending extra money on faster parts. A good example of overclocking would be to take a CPU sold with a clock of 2.5 GHz and then to overclock it to run stable at 3.0 GHz. However, before even beginning to consider overclocking anything there are two very important concepts to understand:1) Every part is unique; you can have two of the exact same rig, set up in exactly the same way with no difference between the two whatsoever, and they will overclock differently. 2) To overclock anything without the proper caution is to risk frying multiple parts within the rig, or to cause various other instability issues that will NOT end well for the computer. With this being said, modern components are built with fail safes that will shut themselves off to prevent permanent damage. This means that overclocking is not nearly as dangerous for the system as it used to be; however, there is always a risk that these fail safes will not work properly and system damage will occur. Before anything in a computer can be overclocked, it must be understood that by far the best way to overclock any component (excluding the GPU) is through the system BIOS. 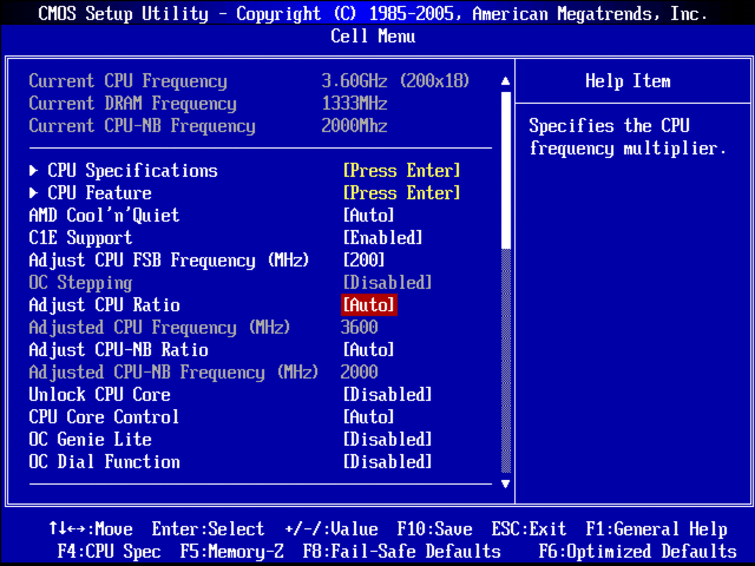 The BIOS can be easily accessed on most machines by pressing the ‘Delete’ key during system start, before the Windows screen appears. Keep in mind that each motherboard has a BIOS that may be unique to that specific motherboard, and that as such care should be taken to read both the settings and any descriptions provided before any adjusting is done. In the following sections I will discuss the basic mathematical principles for overclocking each major part in a computer system. Keep in mind that various motherboards will behave differently in this regard. For example, the motherboard I used automatically computed the math correlation between FSB and CPU clock speeds for me; it came down to simply bumping numbers up to gain better performance. Also bear in mind that many manufacturers provide overclocking utilities for their own parts (such as EVGA’s Precision Overclocking Tool). These will not be included in this article, but are incredibly easy to find (usually within the driver/software section of each manufacturer’s website) as well as user friendly for the initiate overclocker. I do NOT recommend using these to overclock anything other than the graphics card, as changing FSB/CPU/RAM settings within Windows can cause numerous problems when attempting to boot. As such, the BIOS is the preferred method for overclocking.